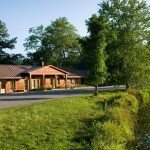 Every Friday during May I am inviting a member of my writer’s group to be a guest blogger. Today I’m excited to introduce new SciFi storyteller Shane Etter, a Mississippi native, who has a knack for bringing the creepy to life in settings ranging from north Georgia to New York City’s underground subway tunnels. 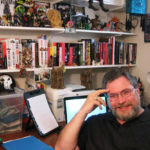 I hope you enjoy his insights today on four lessons he’s learned as a first-time author. I will feature more about Shane and his debut novel in this Sunday’s Relaxing Reads’ book post. Reach Shane on his Bottom Dwellers’ Facebook page. 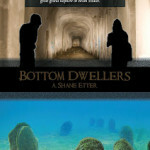 My first novel, Bottom Dwellers, was published in April of 2011 by Black Rose Writing, a Texas-based small press . Bottom Dwellers is a supernatural thriller about green mutant people with gills living on the bottom of one of the largest manmade lakes in the U.S., in north Georgia. It’s the first of what I anticipate being a series of books to follow with the Dwellers theme of a worldwide mutant community. I’d like to tell you about the things I did right, and more importantly, the things I did wrong. By sharing my experiences, both good and bad, hopefully it will help you along your literary journey. The main thing I did right was write. What I mean was, even though I had no training in writing, no degree in English or no MFA, I started writing. If you have a good idea, start writing. That is the first and most important thing. In fact, besides having no training in writing, I was the least creative man you could imagine until I had a stroke, and when my brain started rewiring itself I became creative virtually overnight. Next thing to mention, is the first mistake I made. I had heard you should write every day, and I did write most days, but during my second eight-week writing class under two-time Pulitzer nominee, Jedwin Smith, Jedwin said to write a page every day, and in a year you would have a novel. So, quantifying the amount of writing for me was better than just saying write every day and it has helped me finish my second novel, Radiation Dwellers, much quicker and get well into my third novel, Island Dwellers, much faster. Jedwin’s class brings me to the second thing I didn’t do until after my first novel was published: Find a writing class, at your local Indie bookstore, at a community college near you, or one sponsored by a writing club. Most authors are very generous with their time and knowledge and many of them teach classes on writing, on the side. 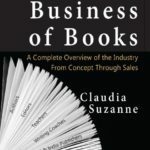 Even though I am a voracious reader, a writing class helped me learn why authors use certain techniques and to apply those techniques. The third thing I didn’t do and you should is find, or start, a critique group with other like-minded writers — people in a genre similar to yours who you can read to, and bounce ideas off of, for helpful, constructive criticism. Fortunately I have since found an established critique group with authors who, though fairly new to writing, had achieved a measure success and could help me avoid making some of the same mistakes they did. That brings me to the fourth lesson: reach out to other writers in your community. Offer to buy them a cup of coffee, or lunch. I do that now and my creativity climbs exponentially by meeting and talking with these creative people. Shane with John Connolly, who he considers the greatest living author. Last, read, read, read everything you can find in your favorite genre and other genres as well, and try to copy their techniques. This thing alone will help you improve your writing as much as anything. 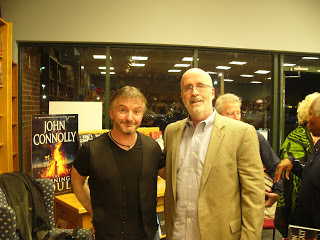 Among my favorite authors are John Connolly and F. Paul Wilson, both of whom write “creepy” novels. Reading and absorbing all of their works gives me better ideas and helps me to get the creative juices flowing. Finally, never give up!! Believe me, if I can get published, you can, too. 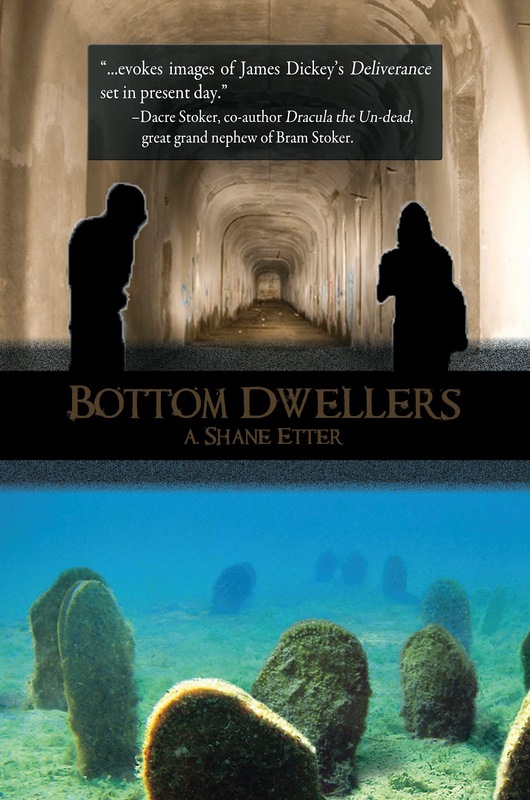 This entry was posted in Author Interviews, Writing Resources, Writing Tips and tagged Bottom Dwellers, first-time author advice, Shane Etter on May 18, 2012 by AnneWainscott. Great information, Shane! I am trying to follow all of your suggestions, although I still struggle to write every day. I especially agree with your suggestion about forming critique groups with authors of similar genres–that has been extraordinarily helpful to me. So glad you are in our writers’ group with Jedwin. It’s a lot of fun to share other writers’ journeys! Thank you, Shane, for posting your thoughts about what to do and not to do. 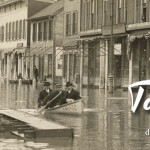 I will likely seek an historical fiction group this fall. Good luck with the next installment of your series!